Hi Guys, I just wanted to start by saying a huge thank you for the positive response that I had from my second blog post. Every comment means a lot to me and I hope that I give a positive mind set to others who are going through their own personal struggles in life. This brings me onto my next blog subject "Never Judge a Book By Its Cover" I just wanted to take the time to explain how I can be judged because I "don't look disabled" how are disabilities different from being "visible" to "invisible". As we know Dystonia comes in many forms, some of these forms are more noticeable/visible than others. This is why I always class myself lucky at times, not in the sense I have Dystonia but in the sense that my symptoms may not be as debilitating as others. My Dystonia affects my mouth, making my speech slurred, disoriented and I struggle bristly with eating. My hands are also affected, which causes some of my fingers to involuntary curl inwards, making it very difficult to do many day to day tasks, such as doing buttons or zips up, sometimes I can be messing about for 5-10 minutes, trying to be patient and do them by myself. 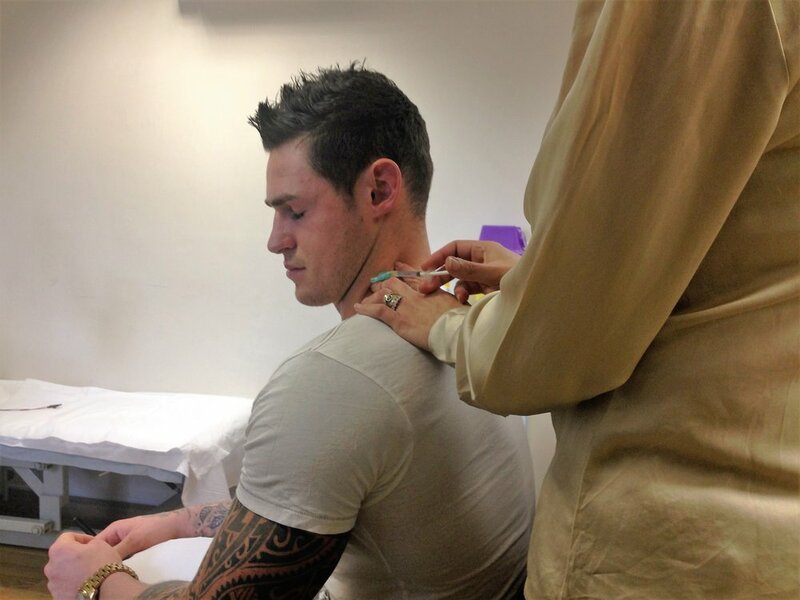 Here are some photos of me receiving Botulinum Toxin Injections, that help to ease my symptoms for a short Period of time but by god are they worth it. I have found with society today, is if your disability is not visible you can't surely be disabled? its such a shame that society can be so judgemental and closed minded. I've had many times over the past eight years of being told "look at you, your too fit to have a disability." or that I've been told I am a fake. To hear those comments was sometimes very hard for me to take in and that's why I had step up my Dystonia Awareness and to show the vulnerabilities associated. By posting videos of my speech and hand therapy sessions, I felt this really helped and gave a insight into my struggle with Dystonia and how I cope. I occasionally model and keeping fit is a huge part of managing my Dystonia symptoms, both physically and mentally. I train hard and to the best of my abilities because it makes feel good about myself and in some sense it makes me forget that I have Dystonia.I look at a photo of myself from the past and I think "look how far I've come". That in itself makes me feel so damn proud of myself. What ever I say of do I know there will always be people who will judge, but unfortunately you have to take the rough with the smooth and its my job to make them see differently or educate them on Dystonia. We need to remember that disabilities come in all different shapes and sizes, and try to see the bigger picture. Each of us have our personal struggles to deal with and nobody should ever feel entitled to judge on the basis of appearance. when you go through a life changing ordeal, your mind set does change. I'm the first to admit that when I was younger, before Dystonia I could be very judgemental. I lacked education and was often swept up by societies idea of what's normal. it is a shame that it took something like Dystonia to change my thought process but it did and I am going to do my best to educate and inspire people to be a little more open minded when passing judgement. Maybe take a step back and think do you know this person, do I know their struggles, their reasoning or explanations and revaluate. As Buddha said "If you propose to speak, is it true, is it necessary, is it kind"
To finish off the blog I would like to leave you with this quote " don't worry about those who talk behind your back, they're behind you for a reason "
Any comments or questions are very welcomed.